More lessons from the African Jungle to dominate in the Concrete Jungle. Read Part 1 here and Part 2 here. An alpha is a bigger than life persona. His presence dominates the central stage. He exudes a certain energy and a magnetism that pulls others towards him. This natural aura that an alpha male leader has is called charisma. By having charisma, others are naturally drawn to him and he gets conferred respect from below. Individuals follow charismatic leaders because they want to, not because they are forced to. A charismatic leader is inspirational in the very essence of his being. Charisma is the ability to affect the emotions of others in a positive way. 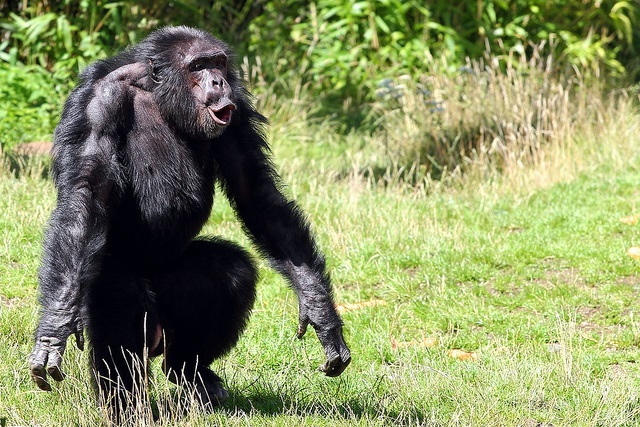 Chimps are very emotional creatures and that’s why charisma plays a great role in leadership. It speaks to them deep down on an emotional level. Charismatic leaders inspire trust and obedience just through the way they carry themselves and communicate with others. The way the alpha carries himself and acts gives him a natural authority over others. He is self-confident and dominant. The alpha sits with his back straight and while walking his every step is done in a powerful way. This natural authority can be observed by the way other chimps behave when they are in the presence of the alpha. Their entire demeanor changes. They get out of his way as if by instinct and naturally make themselves appear smaller. There is a chicken and the egg problem however. Do alpha chimps have charisma because they are in a position of power, or are they in a position of power because they have charisma? The alpha is a hero to others and everyone wants to be like him. He is admired by the rest of his community and thereby followed by them. It’s much easier to hold onto power when you are a charismatic individual, well-liked by others, rather than ruling through the use of intimidation and aggression. You build up allies in an easier way and expend much less energy to keep your status. There are some things that charismatic leaders do that give them that natural aura. They are visionaries and have a catchy vision that inspires others. This vision then gets passed onto his subordinates. A charismatic leader has an incredible ability to communicate and get his message across. Only using body language, facial expressions, a few sounds and without words, a chimp leader captures the attention of the minds of others. The fact that he cannot use words does not diminish his message. Most communication, even by humans, is non-verbal. Charisma is also demonstrated through actions. Charismatic alphas pay attention to the needs of others within their community. They play with the infants and help out when needed. They don’t refrain from grooming other lower-ranking individuals. An alpha leads by example, actively participating in hunts and leading border patrols. A natural alpha is always big and strong. If you want to dominate, you definitely need these characteristics. This gives an inherent advantage over smaller and weaker individuals and thereby increases your own status. Strength is power and power is strength. In most chimpanzee groups, the biggest and strongest individuals are usually at the top of the hierarchy. They don’t need to expend as much energy trying to dominate through other strategies like coming up with clever tricks or building up big alliances. They cannot neglect this, but their size guarantees they don’t need to rely on this. They dominate just by their mere presence. Strength is the showpiece attribute of the alpha leader in a chimpanzee community. It allows him to be more independent and secure in his position. With alliances, you cannot always be sure of the other individuals who are supposed to be your allies, so you need the capability of being able to act alone and take care of yourself. Smaller and weaker individuals have a disadvantage when trying to rise up in the hierarchy. They need to rely on many other strategies and get around their limitations. However all these strategies are meant to give out the appearance of being strong. Chimp males use displays to show this. These displays are supposed to intimidate and prove to everyone how dominant the individual doing the display is. Males also often strut around erect with their hair standing up, in order to make themselves look much bigger. Alpha males have to be intimidating at first sight. Even their shadow should strike a certain amount of fear and respect in all the other individuals around them. However males have a variety of sizes and temperaments and that means there are many different ways to achieve this. Large, aggressive males may rely on brute strength to achieve alpha status. They can physically dominate others and that gives them many advantages. Frodo was one of the biggest and most aggressive alphas at Gombe ever. He relied on his size and aggression to rule. He was one of the few alphas that was able to dominate even without the need for alliances, and all this was due to his size and strength. During dominance displays, Frodo terrorized almost everyone. However Frodo was also notorious for his drive and ability to hunt. For it is not always strength alone that is crucial, but what you are able to do with it. You need skill as well. Strength is not something that is good just for its own sake, but for the fact that it allows you to do certain things that you wouldn’t be able to do otherwise. However you cannot rely on it exclusively or abuse the power that it gives you. Oftentimes an aggressive chimp who uses his strength to intimidate others and terrorize his community doesn’t last long in a leadership position. He inspires rebellions and gets removed pretty quickly. An alpha needs to be foremost a good warrior, whether for defending his status inside his community, for protecting his community from outside threats or for hunting animals for food. As mentioned above, many alphas like Frodo have above average skills in hunting. They have developed stamina and a high intuition to go along with their strength. Hunting combines not only the things listed above, but also requires other traits such as intelligence and courage. The well-being of the community depends on the ability of good hunters to catch their prey. A good hunter has perfected his skills to above average levels. Chimps can map their environment in their own mind and then communicate its features to other chimps using non-verbal signals. They are very good at investigating their environment, which for example helps them develop skills such as tracking. Brutus was the alpha male in his community and over the years had developed his skills in hunting to amazing levels in order to provide for himself and his community. The development of skills has to do once again with the 10 000 hours rule. The more you practice, the better you get. The chimps who practice the most usually end up getting better than their peers. A lot of times, you can see who will become an alpha from early on. The same drive that some chimps have in order to do everything in order to rise up in rank and lead, translates into a drive to get better and better and do everything in order to improve. You can only acquire greater skills with a persistence in learning. For example, young Figan saw the rise of Mike to the top and as a youngster that was inspirational to him. He would often go out by himself and try to imitate what Mike was doing. He would spend countless hours practicing with cans day in and day out. He was the only one out of all the youngsters doing that. Figan would later rise to become the leader of his community. Chimps develop their abilities from very early ages. Their play is often very functional in that it teaches them skills they will need later on. Much of this could be compared to martial arts training. They play fight with each other, learning skills that are needed in order to overcome an opponent in a real fight. They roll around and grapple with each other, doing things that resemble MMA. They chase each other, overcome natural obstacles and swing from tree to tree, which resembles parkour. Chimpanzees are incredibly strong. They are much stronger than humans. This is due to the way their muscles are set up, but also to a lifetime of doing activities that cultivate their strength. Some guys in a circus once did an experiment on chimpanzee strength and found out that the chimp could lift really heavy weights. Was progressive overload born in the African jungles? A chimpanzee needs all this strength to be able to live in the jungle. Life in the wild is tough and incredibly dangerous. This means that the alpha male has to be first and foremost a warrior. His survival and the survival of his entire community depends on this. Being able to catch dinner, but also beat off attacks from rival communities is a matter of life and death and requires real strength and real skills. Being big and strong gives a huge survival advantage to the individual who embodies these traits. He can do things that ensure that he lives to face the challenges of another day. This also gives him automatic status within his own community. The bottom line in relations between individuals is that the one who is stronger is also usually the one who is dominant. Strength and size conveys power. If an individual is big and strong, others innately show them respect. Size and strength make an individual look intimidating, which makes others less likely to mess with them. This is the best resolution to a conflict: avoid it before it starts. However also having the ability to finish it to your advantage if it does break out is a must. Appearances must be backed by actions. Chimps are notorious for having emotions run their actions. There is even a book by a professor named Steve Peters called the “Chimp Paradox”, which tries to teach people how to tame their “inner chimp” and get in control of their emotions. However self-control is not something that is totally absent among chimpanzees. Scientific experiments have demonstrated that it is actually present and that the entire chimp hierarchy is based around impulse control, which is one form of self-control. The ability to react in the right manner after reading a particular social situation is all about controlling your impulses. Lower ranking chimps have to control their impulses all the time when they are around higher ranking chimps, however even the higher ranking chimps need to control their impulses and react appropriately. The most successful chimps are the ones who have the highest amount of self-control. Thereby self-control is one of the main qualities that an alpha chimp needs to have in order to rise and stay at the top, especially if they are not physically dominant. Self-control is the ability to inhibit responses to some outside stimuli that are appearing at the moment. This is done in order to benefit from something even better later on. This is the basis of persistence in learning. There are many distractions in a chimp’s environment and most chimps get easily distracted by them. However in order to better yourself, you need to focus and not get distracted. Chimps like Figan understood this. While other young chimps would get distracted by the latest flashy thing, he would go out and practice working the cans, the same way that Mike, the alpha male of his community, did. He demonstrated an amazing amount of self-control when he was doing that, which then led him on a successful path to mastery. Self-control is a prerequisite for the path to mastery. However how do you keep your mind off the shiny thing in front of you, in order to delay gratification? It has been observed that the chimps use several strategies to help with this, the primary one being distraction. They distract themselves with something to take their mind off the urge to partake in instant gratification. For example chimps that are trying to accumulate large quantities of food for storage keep themselves busy to avoid the temptation to eat it all up straight away. In one experiment, chimps used toys in order to distract themselves from the food that they had in front of them. The basis behind self-control is not just individual willpower, but also the environment that you have around you. 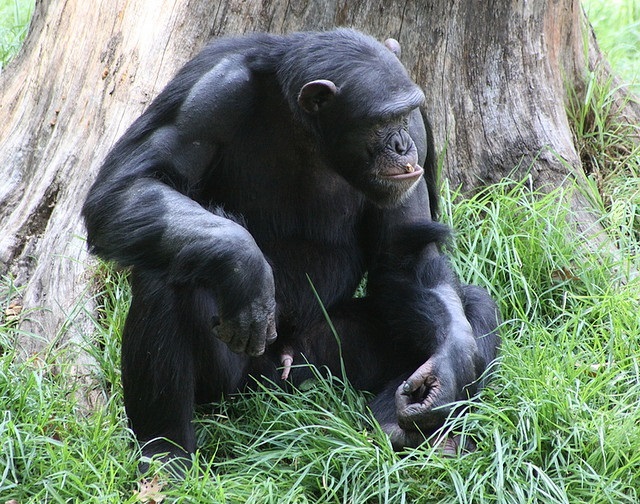 Scientific experiments showed that chimps exhibited better self-control in certain environments over others. Even the individual with the strongest willpower can break down in the wrong environment, so that’s why it is so crucial to set up an environment around you that promotes good habits and self-control. The right environment is not only about the material things around you, but also the different individuals that you hang out with. The ability to exert control over yourself also results in better planning skills and higher rates of achievement. This is very important for any individual that wants to plan out a course of action and then carry it out. The willingness to take risk is a very important trait for any potential alpha male. Every alpha starts off as a beta or lower in the social hierarchy. In order to take over the alpha position, they need to challenge the incumbent alpha male of the community. This always implies a certain amount of risk. This means that anyone who is not willing to take risks can never be an alpha. Risk-taking for an alpha happens on two levels, for the benefit of oneself and also for the benefit of the group. In order to rise in status in a social hierarchy, the potential alpha needs to be willing to engage in a certain amount of risk by doing activities that will be threatening to the position of other males in his group. When feeling threatened, these other males might react in a violent way, which could result in bodily harm to the individual that is taking the risk. With any risk, there is the potential of failure, however without the actual act of taking that risk, there is also only a very miniscule possibility of any type of success. Big gains only happen with big risks. The ability to take risk is intertwined with courage. The alpha male has a duty to protect his own community and courage is a very important component of that. A leader needs to show courage in adversity. He needs to be able to risk bodily harm to provide and protect his group. The world that the chimpanzees live in is extremely dangerous. It is full of wild animals, other violent chimpanzee groups and also the most dangerous species of all, humans. When his group is threatened by any of these things, the alpha needs to be at the forefront of defense. He needs to show courage and protect his own by launching himself into the heat of the battle. The group displaces itself quite frequently, going from one part of its territory to another, either for feeding, going to a waterhole, resting or a variety of other activities. This is a potentially dangerous situation and the higher ranking males need to ensure the safety of the group during the entire time of travel. One example of this comes from Bossou in Guinea. 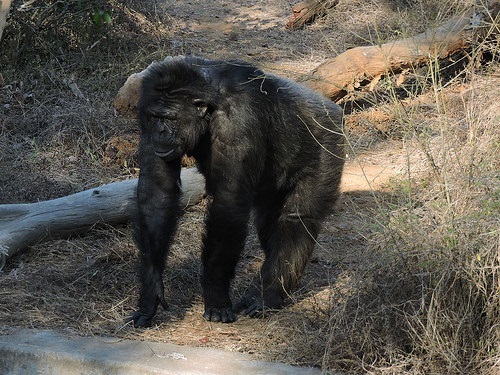 There, several roads cut through areas where chimps live and so the chimp group needs to cross them whenever they are moving from one part of their territory to another. The chimps don’t cross alone, but instead gather at a particular point in the bushes next to the road. Crossing the road is quite risky and so the higher ranking males take most of the risk on themselves. In these instances, the males act cooperatively in order to maximize the safety of the group. In this particular chimpanzee group, there were three males vying for the top position. There was Tua, who was the long-time alpha of the community. He was then replaced by Foaf, who in turn was later replaced by Yolo, with Tua then falling into third place in the hierarchy. While they were rivals for leadership, they also knew that they needed each other in order to ensure the survival of their community. When crossing roads, the highest ranking males often exchange positions. For example in one instance, the second ranking male was the one who scanned the road and then led the group across, while the first ranking male took the last position in the rear of the group, guarding them from attack from the back. During the times that Yolo was alpha, he would sometimes be the one who would scan the road first, while at other times, he would stay behind and be the last to cross. He would always be taking a considerable amount of risk in whatever position he took. In order to further illustrate what types of risks alphas take to protect their community, we can turn to the Tai Forest and the alpha named Brutus. During one of their marches, one of the females of the group was attacked by a leopard. Brutus did not hesitate and immediately led five other males to attack the leopard and save the female. He then tended to her wounds for over 2 hours as well, showing not only bravery, but also compassion and generosity. One important thing to note is that chimps engage in aggression against other groups. They either raid enemy territory or they patrol their own territory to prevent the enemy from raiding theirs. Most attacks occur on the boundaries of the territories, especially during the times when parties of adult males are patrolling their own boundaries. Patrolling is one of the primary defensive activities that the males have to perform. Bravery is at its heart. Whenever a group sets out on a patrol, they run the risk of encountering a rival group and things escalating out of hand. The males most often prefer to go on patrol with other males that they hang out with in general, whether it is their grooming partners, friends, or coalition allies. They need to be sure that the guys they are out patrolling with have their backs when trouble breaks out. They need to be able to trust that the other guys are willing to take the same types of risks as them. This is where honor comes into play. Chimps become heroes outside the domestic sphere. A good leader is a warrior. He leads his troops into enemy territory, conducting raids. He is not an armchair general, but leads by example. “The larger group, all or nearly all adult males, settles into a journey, stopping now and again to listen and look and rest. After a twenty-minute climb they reach a ridge, a border zone where they can either look back into their own valley or onward into the neighbors’ range. They rest. Several climb trees. All are silent. All face the neighboring range. To the west, Lake Tanganyika sparkles through leafless trees. After ten minutes they go on, more slowly now, cautious, newly alert even to ordinary sounds like snapping sticks. They leave the familiar range behind. They pause, listen. No calls from the neighbors. Are the neighbors somewhere around, merely silent as we are? Or are they away in this dry season, eating the parinari fruits in the high valleys? The party presses on. Penetrating deep into unknown territory controlled by a rival troop of chimpanzees is an act of daring, requiring a high amount of courage. It involves a lot of risk. The leader never knows who his raiding party will run into. There is danger everywhere, which just multiplies the risk. However if the raiding party comes back home and successfully completes its mission, the advantage it gains could be tremendous. However, a smart alpha male only takes calculated risks. He knows when to take a risk and when it isn’t worth it. With risks, there always needs to be a balance, you cannot be too gung-ho. On raids, the chimps tread carefully, watching for the slightest sign of danger and ready to run away when the odds are not in their favor. In fighting, chimps are actually quite risk averse. They usually only attack when they have a huge numerical advantage, trying to avoid getting bodily harm to themselves. In order to make the right decisions, an alpha needs to be calm under pressure. Only that way will he not get carried away with feelings of false bravado and take on too much risk, which could get him killed. Alphas survive in situations where other apes give up. At the Tacugama Chimpanzee Sanctuary in Sierra Leone, Bruno the community’s alpha male, once organized a daring escape from the enclosure. He led a group of 31 chimps to the outside world. In the process, they attacked a group of US tourists and killed their local driver. However, over time, most of the escaped chimps returned of their own free will, but not the alpha. He was never seen again. Most chimps cannot survive in the wild on their own. There is too much danger out there. The alpha can. Bravery among chimpanzees has even passed into legend among the local human populations. There is one mysterious community of chimpanzees living deep in the jungles of the Congo, who are known among the locals as lion-killers. Only very little is known about them, since they live isolated and far away from any type of human habitation. They are the biggest chimpanzees ever witnessed. In popular literature they are known as the Bili Apes. 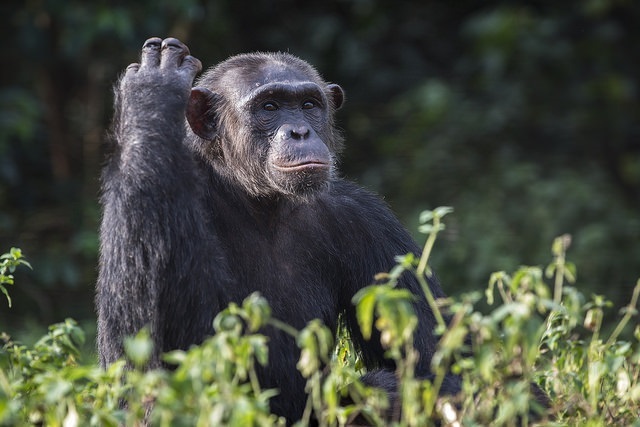 Unlike other groups of chimpanzees, who either run away or attack when they see humans, these chimps have a natural curiosity about their primate cousins. When they see humans, they surround them and look at them with a wondrous stare. Not much is known about this mysterious group of brave chimps, but scientists have witnessed some of them feasting on leopards, potentially proving their reputation as lion hunters true. A chimp needs to be extremely brave to be able to hunt for lions and leopards and only very special individuals can do it. Interested in part 4, when would this come out? I had begun writing it, but it takes a lot of research to get this out, and I didn’t have the time. Then I turned to other topics. An initial very rough draft of that article (and a bunch of research notes) exists, but I am still not sure when I will get back to finalizing it. The article has been sitting put for a long time now unfortunately.